It was standing-room only at the May 1st feast day celebration of Santa Maria de Acoma mission in McCartys, NM. The patron saint at McCartys is the Virgin Mary, and each year on the first weekend in May the people gather for a Mass and procession in her honor. Santa Maria de Acoma is one of the most notable churches in New Mexico, standing out prominently on the hillside above Interstate 40 just east of Grants. The style and architecture of the inside and outside of the the church reflect the old Spanish missions established in the 18th and 19th centuries, with carved wooden beams and adobe-style walls inside. But the church itself is less than a century old, established in 1933 as a mission of Acoma Pueblo. 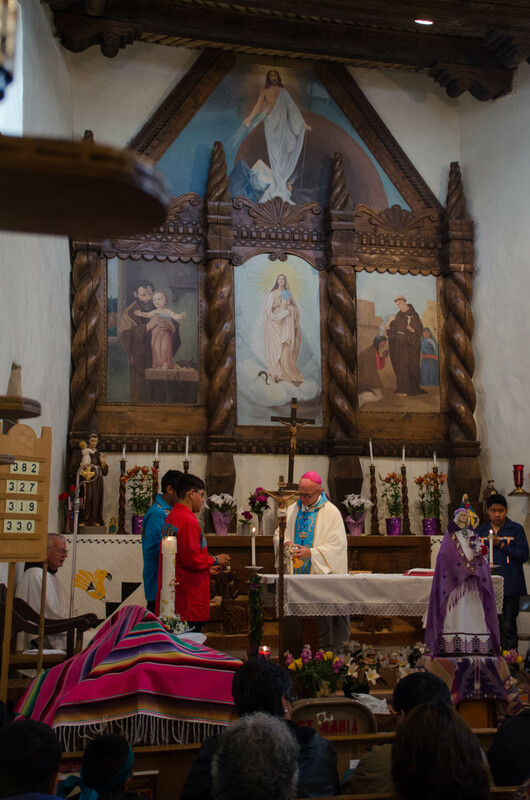 “The tribe at Acoma helped to build this church, and so they are very involved with the feast days,” said Fr. Wayne Gibbeaut, OFM, pastor of the mission churches in Laguna and Acoma. He noted that even the statue of the Virgin Mary, crowned at the beginning of the feast day Mass, has been an old and treasured piece of the history of the church from the beginning. Bishop James Wall was the main celebrant of the Mass, with Fr. Gibbeaut as concelebrant. Members of Acoma Pueblo filled the church, many dressed in colorful traditional dresses and shirts and wearing moccasins. Whole families were in attendance, with many parents holding their small children or making room for elders. This strong sense of faith, family and culture was personified in a husband and wife celebrating their 10th wedding anniversary. They were presented before Bishop Wall, who congratulated them and then blessed their wedding rings. At the conclusion of the Mass, the statue of the Virgin Mary was reverently taken up and carried in a procession around the outside of the church. At intervals, a Native chant was said and the statue was presented to the four cardinal directions sacred to the Pueblo peoples, beginning with the north. At the conclusion of the procession, Governor Kurt Riley and 1st Lieutenant Governor Raymond Concho, Jr. of Acoma Pueblo each gave a blessing in the traditional Keres language and thanked the bishop and the people for their faith and participation in the feast day celebration. Although the day was cold, due to a late spring snowfall, the spirits of the people were high, with Governor Riley cheerfully noting that the tribe would always welcome moisture.